I think Tim’s recent observations that fractal art is about to undergo into a new Phase Two paradigm shift are on target. Fractal art will never evolve beyond a curious, trippy, decorative craft until it moves away from being defined by software and instead starts thinking and acting like a legitimate form of expression within the broader parameters of the fine arts. How true. If fractal art is art that has fractal characteristics like recursion and self-similarity, then the traditional mediums of the fine arts can be used for our genre just as easily as software. In fact, one could build the case that a true exhibition of fractal art would showcase art made using a variety of self-expressive tools — including painting, sculpture, ceramics, graphics design, and other recognized mediums. Software utilizing fractal algorithms to generate images would still be included, of course, but would merely be another component in the artistic arsenal, and such imagery might be broken into distinctions like algorithmic art or digital art, depending on the amount of graphic processing an individual artist used. But fractal art would be category of art, like abstract expressionism or cubism, and not winnowed down to be only the primarily Ultra Fractal images that will win this year’s BMFAC. In the spirit of Phase Two, here’s my idea of a real fractal art exhibition that includes the kind of work you won’t see displayed in next year’s Benoit Mandelbrot Fractal Art Contest show. 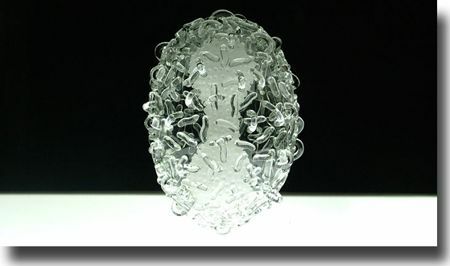 E coli (including detail) by Luke Jerram. 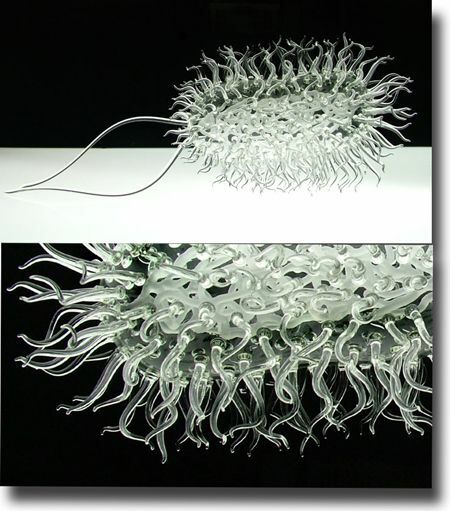 Medium: Sculpture/Glass. It’s worth stressing again. Decoration isn’t enough. Meaning makes art. Fractal Fish by Kevin Gordon. Medium: Glass. 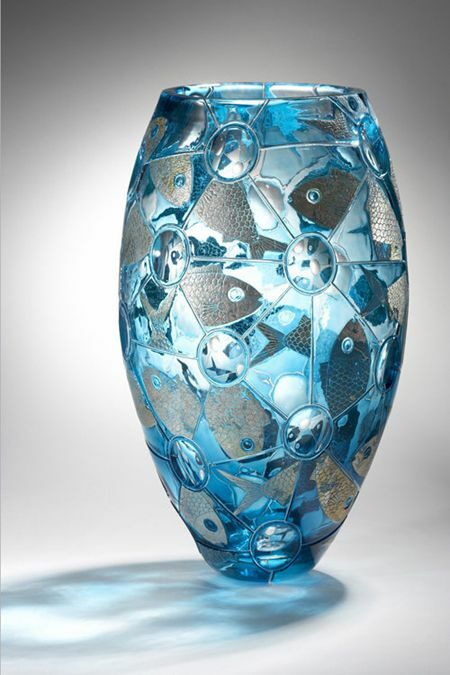 [Gordon] fuses layers of glass, with engravings and incised prisms and lenses to trap and transmit light and colour. The prisms are influenced by fractals and the ‘Mandelbrot Theory’ where the image is composed of smaller reflections of the whole. Gordon’s preferred technique of engraved cameo glass, popular in nineteenth century France, is used by few glass artists in Australia because of its technical complexity and lengthy production time. Isn’t Gordon’s work as worthy of being called fractal art as anything made in UF today and posted to the Fractalbook gallery of your choice? Technomorphic Fractal Dragon by Art Videen. Medium: Sculpture. Another mechanical solution to an assembly issue, are the loops that are seen in much of his work. To Art, the loops immediately took on the meaning of dimensional bands in space and time. 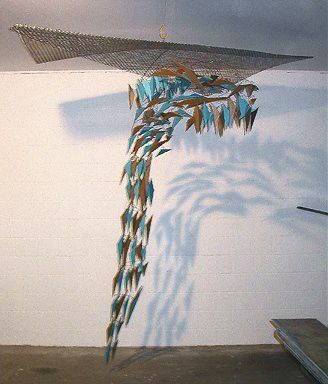 He saw the sculpture as objects suspended within the bands of space and, therefore, referred to the sculpture as “suspensions.” Others noticed the anthropomorphic shapes combined with the technical assemblage and referred to the sculpture as technomorphic . . . combining anthropomorphic and technical. Doesn’t Videen deserve a corner installation at the next BMFAC? Too bad he’s using the wrong artistic format. Broccoli by Natasha Harsh. Medium: Oil Paint. 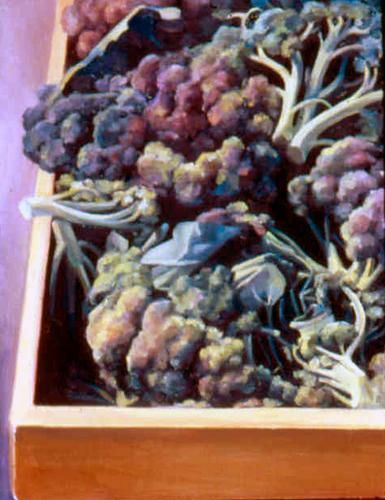 If vegetables like broccoli and cauliflower display natural fractal forms, don’t they retain those forms when painted or sculpted? Natasha Harsh’s painting seems to reveal some common stalks and bubbles configurations I often saw when I first explored programs like Stephen C. Ferguson’s Tiera-Zon. How unfortunate Harsh won’t be able to meet BMFAC’s entry specifications. If only she’d had the foresight to quit painting and instead import a photograph of broccoli into UF5 instead. Then, it seems, no one would question whether she was making fractal art. A comic book cover seen on Patterns of Visual Math. Medium: Graphic Design/Comic Art. 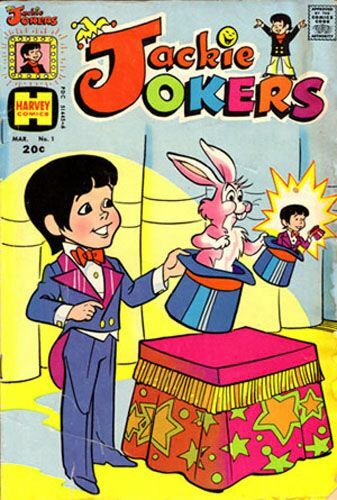 While I’m not ready to argue this cover for a circa 1970’s Harvey comic constitutes fine art, it does show recursion. However, I am ready to go out on a limb and predict this illustration will contain more obvious fractal properties than some of October’s BMFAC winners and legion of runner-ups. 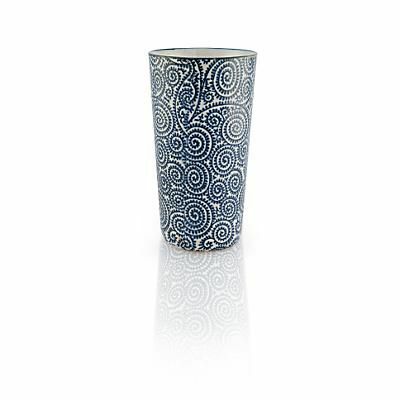 Fractal Tea Cup. Sold on Teavana.com. Medium: Ceramics. It seems the concept of what a fractal is might be more imprinted in mass culture than some of us have been led to believe. The Benoit Mandelbrot Fractal Art Contest claims one of its missions is to select fractal art “that represents our art form to a world that largely does not know it — or if they do know it, they know only garish, 70s-style imagery.” If mass marketing has gotten a handle (no pun intended) on what fractals are and look like, can mission creep into the public mind be far behind? Is it just as possible that BMFAC wants to convince the world that its narrow definition of a UF layered and processed image is the only legitimate expression of our art form? And I wonder who exactly might benefit if such a meme started to stick in the collective consciousness? Such a far-reaching but constricted view of fractal art is only possible if our community continues to embrace a Phase One mindset, but emphasizing software over artistic context and content is dead end. Breaking into the fine arts is our only hope for being seen as bona fide artists. Although your latest 1000+ decorative layers of UF epic technical achievement might wow some Fractalbook fanboys, it won’t matter in the long run if your image is still meaningless schlock that looks like a bad Yes bootleg cover. You’ll never be, as Dire Straits once sang, “In the Gallery.” A real gallery, that is. No, you’ll still be languishing in Phase One craft malls, and the shoppers strolling the flea market looking for trinkets won’t be able to tell the difference between your lovely, over-saturated spirals and the pretty, painted rocks in the next booth. An artist who faced the challenge of making great art about nothing and renounced all decorativism and sentimentality, which never cared for the taste of the crowd and (because of that) was totally misunderstood during life time due to his radical stance in the reality of art , was the American painter Ad Reinhardt (1913 – 1967). Since critics wrote very little about his work, he wrote an interesting book called "Art as art”. There we can observe that making art about nothing is not the same thing of doing art without meaning. The art of Reinhardt apparently did not show anything, but it is entirely about meanings.